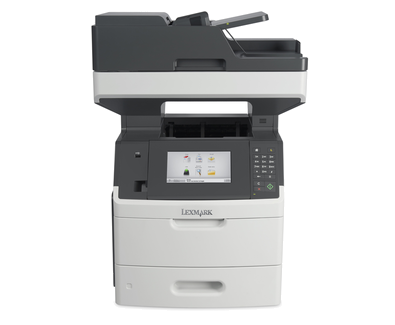 The robust Lexmark MX710DE MFP is intended for large workgroups. This multifunction device can print, scan, fax, and copy. It has built-in networking connectivity and also has handy features such as a touchscreen display and automatic duplexer. The Lexmark MX710DE multifunction printer has a monthly duty cycle of 275,000 pages and has a maximum print resolution of 1,200 x 1,200 dpi. This all-in-one device can handle a wide range of media but when scanning the maximum size is legal paper. This model has a large control panel with a seven inch touchscreen display and numeric keypad. The Lexmark MX710DE A4 mono multifunction laser printer has a maximum paper handling capacity of 3,300 pages and it has a print speed of 63 ppm with the first page out in 4.4 seconds. The MX-710DE monochrome laser printer is integrated with 512 MB of memory that can be expanded to 2,560 MB plus it has a dual core 800 MHz processor. The black and white Lexmark MX710DE MFP has high paper handling capacity and is integrated with a 150-sheet ADF. It can help save time with its impressive performance speed and handy features such as the ADF, RADF, and automatic duplexer. The USB host is also handy for direct scanning to and printing from thumb drives. Networking is made easy as the MX710DE workgroup printer is compatible with PC and Mac and it has built-in Ethernet. Large print jobs can be kept moving and handled more cost-effectively with extra high capacity Lexmark MX710DE toner cartridges. This unit may have a small footprint but it has a bulky appearance. The Lexmark MX-710DE printer is quite pricey and yet the wireless LAN connectivity must be bought separately.